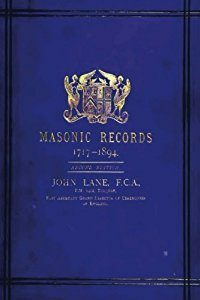 John Lane was a Masonic historian who first published his magnum opus Masonic Records in 1886, the work being a listing of all the lodges formed under the English Grand Lodges (both Antient and Modern), including the numbers and various locations of the lodges, from 1717 to 1886. Lane collected information from a variety of sources; Grand Lodge registers, minute books, Grand Lodge Proceedings, Warrants and Warrant Books, engraved lists, Masonic calendars, various lodge histories and various lodge minute books. The book was later revised in an updated edition to include lodges up to 1894. Freemasonry was growing fast in the later Victorian period. The work itself became an essential reference book for the Masonic historian, and by 2003, the University of Sheffield transferred Lane’s book into digital format, and since 2008, the United Grand Lodge Library and Museum have been adding information about lodges formed after 1894. The entry for each lodge formed since then, including lodges subsequently erased, features the warrant date, number and meeting places (Freemasonry Today, 2013). John Lane was born in 1843 and was based in Torquay, Devon, in the south west of England. He was an accountant by profession, though he had also worked as an Insurance collector and a secretary to a cemetery company. Lane had been initiated into the Torquay based Jordon Lodge No. 1402 in 1878, and went on to join the London based research lodge Quatuor Coronati Lodge in 1887, being awarded the rank of Past Assistant Grand Director of Ceremonies by United Grand Lodge in 1895. Lane had also been awarded the rank of Past Senior Grand Warden in 1888 by the Grand Lodge of Iowa in the US, which at the time had just begun to build one of the largest Masonic libraries in the world. His work was well respected; he had written a number of papers for the Transactions of Quatuor Coronati Lodge and had a number of other books published including A handy book to the study of the engraved, printed and manuscript lists of lodges from 1723 to 1814, published in 1889 and Centenary warrants and jewels…which was published in 1891. It was his Masonic Records that he is best remembered for, and is still regularly used by Masonic researchers and family historians due to the updated online version. He died at the age of 56 in 1899.